We enjoy Montrose immensely and always have a good time of fellowship & relaxation. What started as a 10-day summer Bible Conference in a tent in 1908 has expanded into a year round multi-faceted Conference, Camp and Retreat Center! Located on 83 acres in the beautiful Endless Mountains of Northeastern PA with two campuses, We provide a place for adults, teens and children and families to experience God. Montrose Bible Conference is a 501(c)3 non-profit organization which allows for charitable gifts to be deducted on your taxes as allowed by law. Our mission is to provide a place away from the routines of life to be with Christians so that people can grow closer to God and share His love with others. It is and shall remain the policy of the Montrose Bible Conference to carry out its purposes in light of the following principles of faith. 1) First and foremost, we believe that the Bible is the inspired Word of God, and that it is the only infallible and sufficient rule for deciding issues of faith and practice In the application of this belief through the carrying out of our purpose, the Board of Directors of the Conference is the sole authoritative interpreter of Scripture. 2) Additionally, we believe in the sanctity of the institution of marriage as it is set forth in Scripture, and that it is defined as the union of one man and one woman. Furthermore, we believe that the only legitimate and acceptable sexual relationship for mankind is to be between one man and one woman, bound in holy matrimony, according to God’s Word. 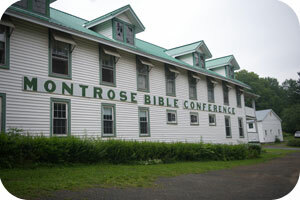 As a non-profit Evangelical Christian organization, Montrose Bible Conference reserves the right to refuse or cancel services or facility use to any individual(s) or group whose willful activity, teaching, or conduct detracts from the Conference's Christian witness or is contrary to the Principles of Faith and Statement of Faith. We believe in the entire Bible, consisting of the Old & New Testaments as verbally inspired by God, and inerrant in the original writings, and that they are of supreme and final authority in faith and life. We believe that Jesus Christ was begotten of the Holy Spirit, and born of the virgin Mary, and is true God and true man. We believe that man was created in the image of God, that he sinned and thereby incurred not only physical death but also that spiritual death which is separation from God; and that all human beings are born with a sinful nature and in the case of those who reach moral responsibility, become sinners in thought, word and deed. We believe that the Lord Jesus Christ died for our sins according to the Scriptures as a representative and substitutionary sacrifice; and that all who believe in Him are justified on the ground of His shed blood. We believe that at any moment the Rapture of the saved may occur, when “the Lord himself shall descend from Heaven” to catch up his people to meet Him “in the air”. We believe in the personal, bodily and premillennial return of our Lord Jesus Christ to set up His kingdom upon the earth. We believe that salvation is by grace through faith, and that all who receive by faith the Lord Jesus Christ are born again of the Holy Spirit and thereby become children of God. We believe in the bodily resurrection of the just and the unjust, the everlasting blessedness of the saved, and the everlasting conscious punishment of the lost. We believe it to be the supreme responsibility of the disciples of the Lord Jesus Christ to make His Gospel known to all men. We have many opportunities as we begin our second century of ministry. We look forward to ministering to our local community, the surrounding area and ultimately impacting a needy world with the love and hope of Jesus Christ! Montrose operates year round with accommodations for up to 275 people. Our Conference Center and youth campus are well equipped to serve a variety of groups. We can plan a variety of programs for you and your group to attend, or you can plan your event and use our hospitality service to enhance your experience! Our guest services team is eager to serve you!